for National Youth Arts Week! 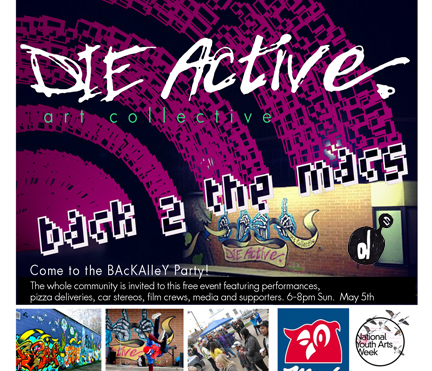 It all culminates May 7th at 6pm, with A BIG REVEAL and a BAcKAlleY Party, everyone in the community is invited. A free event featuring performances, pizza deliveries, car stereos, film crews, media and supporters! Swing by May 1st to 7th to see them paint live, 12-5pm in the MAc’s Alleyways! This is a large public painting project in partnership with Mac’s Convenience stores and the City of Thunder Bay’s Crime Prevention Council and for National Youth Arts Week. This initiative is a pilot project developed in celebration of youth, community and arts in Thunder Bay. This innovative art partnership project builds upon the growing strength/phenomena of the Die Active Art Collective, which is now entering into its fifth year of contemporary art activities involving new generation artists.